Sorry for the delay on this update……Westbrook seems to be feeling good and doing good. 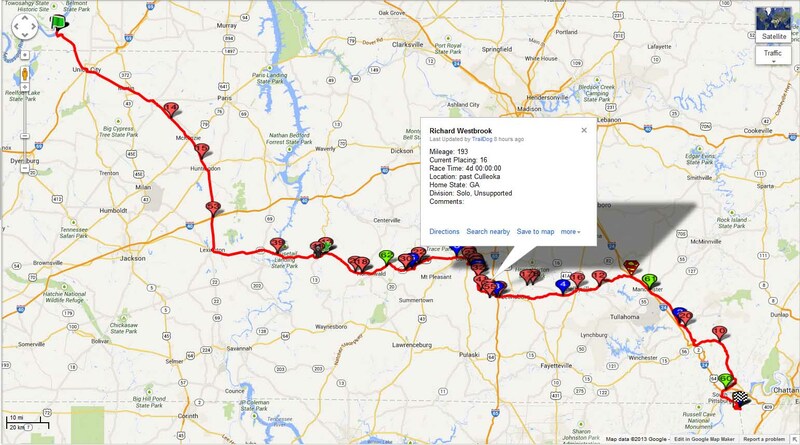 As of this morning check-in he was past Culleoka, leaving Mooresville and almost to Lewisburg Square. He has moved into 16th (15th if the one relay team has in fact dropped out – no more check-ins from them) overall, 12th overall in the individual runners category and 8th overall in the individual/unsupported category. He is doing great and moving up. IT IS HERE…Vol State, once again! OK, it is here, Vol State 2013. Richard will run the race uncrewed, or screwed, as the race website posts it. The race is a 500K (314 miles). The start is in Dorena, MO all the way to Castle Rock, Ga. The race will start July 11 at 7:30 am. All he has with him is one small pack to carry on his back while he races for days, similar to the pack he carried last year in the photos below. His plan is to be outdoors the entire time, sleeping where ever he can find a semi-comfortable place. A hotel will come into play ONLY if there are severe storms where he may need to take some sort of shelter. 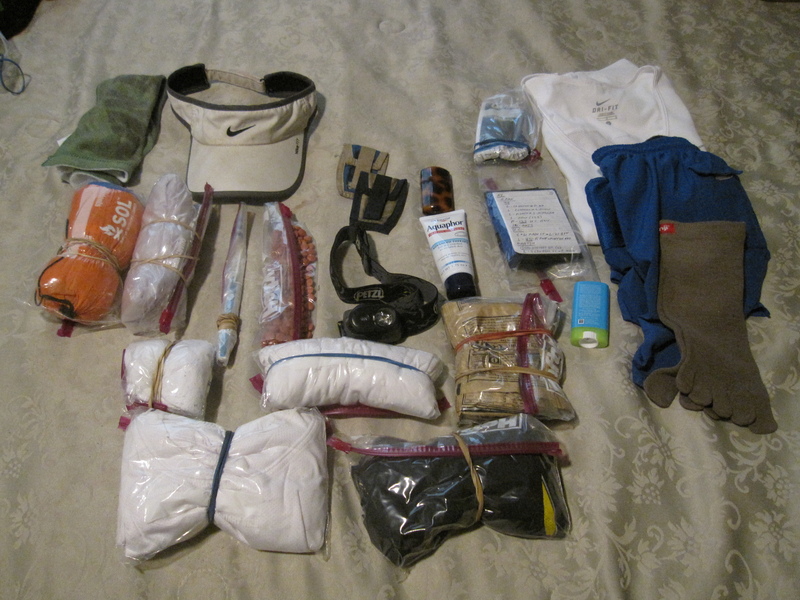 Richard’s pack for Vol State 2012, weighed approximately 6 lbs. Loaded. Ready to go. Richard will drive to the finish of the race tomorrow where he will be driven over the course to the beginning. There is a website for the race if anyone would like to track him while he runs, http://www.tinyurl.com/volstate2013 (Westbrook is number 55 on the map). If not, we will be posting updates as often as we can on here. Once again, he is uncrewed with NO support, as most of the runners are in this race. 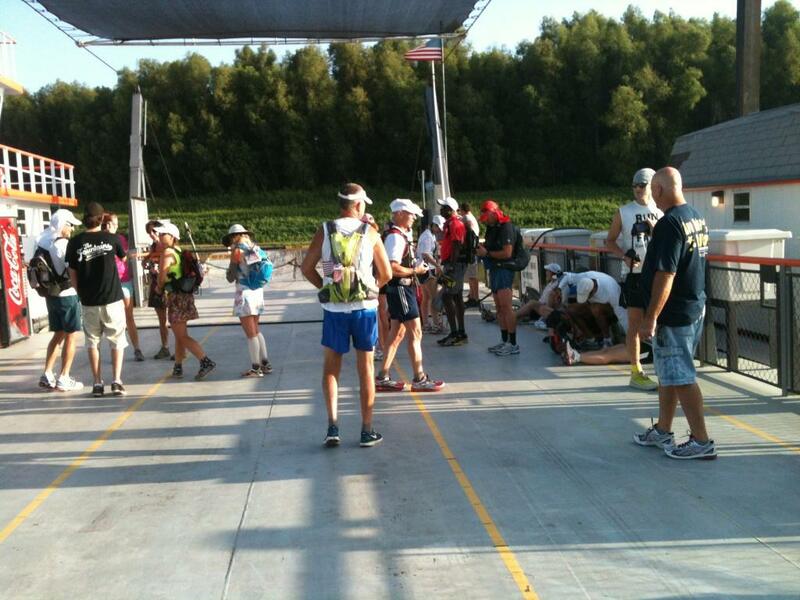 They are starting with 55 individual runners and some relay teams as well. Richard with his pack, ready to go, at start of Vol State 2012. Wish him luck, follow his progress, and read the results and his thoughts on the race afterwards. It was the best of times, it was the worst of times, it was the age of wisdom, it was the age of foolishness, it was the epoch of belief, it was the epoch of incredulity, it was the season of Light, it was the season of Darkness, it was the summer of hope, it was the summer of despair, we had everything before us, we had nothing before us, we were all going direct to Heaven, we were all going direct to Hell – in short, the period was that of extremes, highs and lows with some moderates. 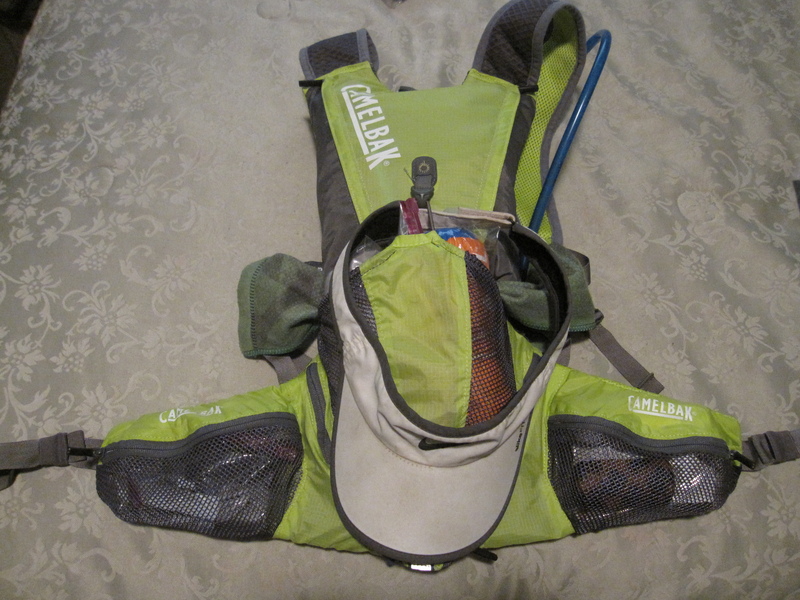 In comparison, each runner experienced his or her esoteric learnings brought to the surface by the monumental task of the Vol State Road Race in the month of July in the year of 2012. Thus, the paraphrasing of the opening lines of the classic, A Tale of Two Cities, by Charles Dickens. The book was written of other things and other times. But, the often quoted opening lines apply to the Vol State Road Race 2012 just like the bonding of the Vol State to thirst and fulfillment, joy and anger, pain and euphoria, loneliness and camaraderie, hunger and satiety, staleness and excitement, stubbornness and anxiety, complacency and spirituality, doubt and confidence, patience and impulsiveness…and, maybe, a little insanity mixed in to what we think is normalcy. Each runner in the 2012 event can relate to many of the aforementioned qualities. Now, that it is over, more questions may arise. 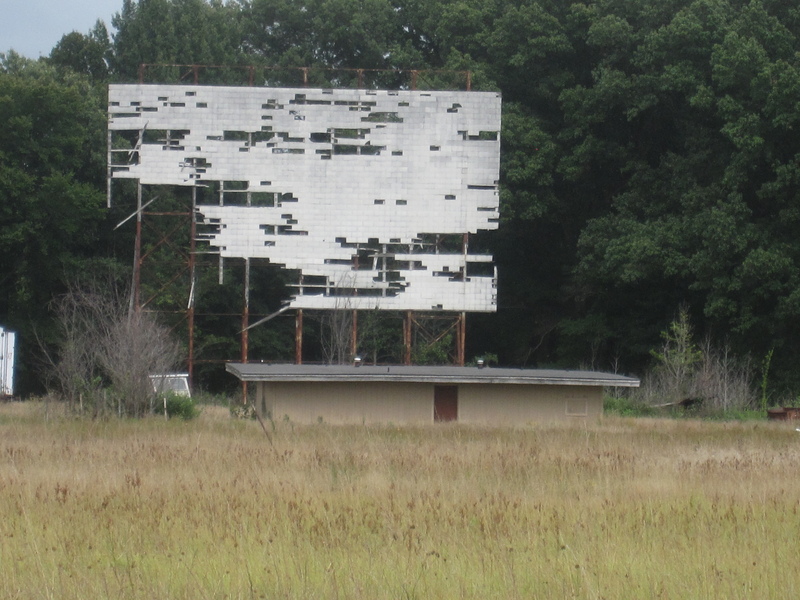 But, more importantly, more answers may have been found. Therein lies the real truth of the long run…discovery. Each finisher is not the same person as he or she was at the start. Each of us is someone different. Only the runner can know to what extent. 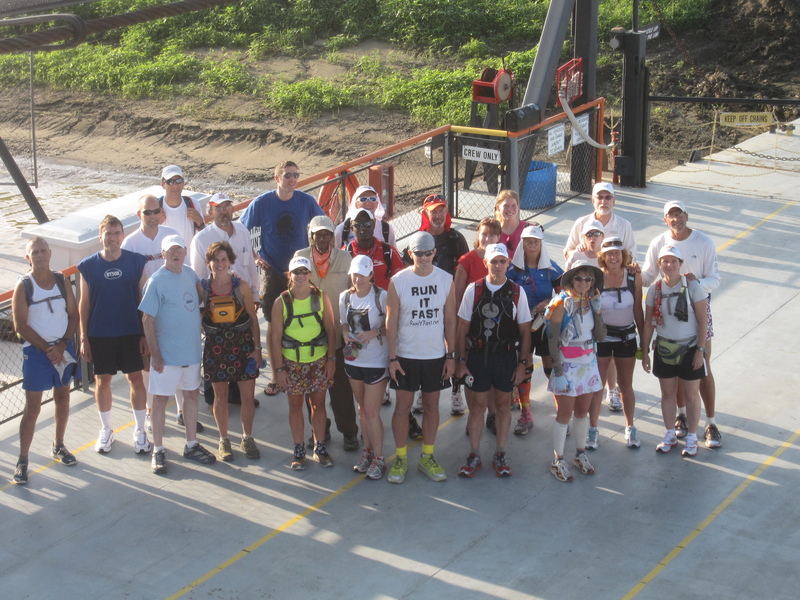 The journey of the mind and body began by running off the ferry in Hickman, Kentucky. In a race where anything can be expected, the start was the start of great unexpectations. The ferry was grounded which prevented the crossing over and back on the Mississippi. Instead of starting in Missouri, we adapted and started on the ferry deck and ran into Hickman. Gary Cantrell modified the time in order to equate with past Vol States, equality being the key. Each runner’s mind was working to adapt to the run and apply one’s biology to the mileage, duration, terrain, and environment ahead. Problems were to be predicted and, hopefully, solved. If not solved, the runner would suffer. The amount of suffering would change over the 314-mile distance lying before us toward the southeast. I ran easily, slowly up the small rise leading into Hickman. I glanced around feeling like the rookie that I was in this event. Most were walking. Did they know more than I did? Obviously, since most had run this before. Still, I ran up the small hills talking to some of the others that were running. Two guys were taking it out. Not me. The hills got severe in old Hickman until we were at a high point overlooking the ferry and the course behind us. I stopped to take a photo and to breathe. My mind was doubtful about what was out there ahead of me. I did feel good about my pack and its non-obtrusive presence that marked me as part of the solo or “unscrewed” division…as were most of us in this parade. But, that did not sway the malignant doubt and anxiety about the immediate future. A hardy group of adventurers on the ferry to start the Vol State 2012.